Successfully Added LED Color Changing Panel Light with Remote Control to your Shopping Cart. 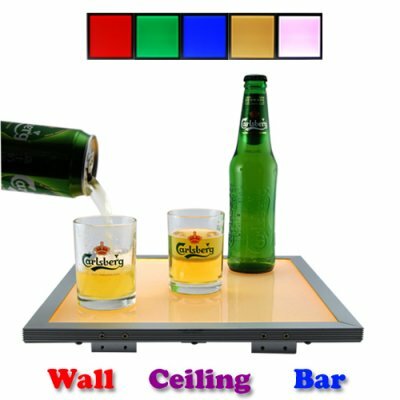 Hot new color changing (16-color) LED light panel with remote controller for adding colorful lighting to any room. Do you have a wall or bar countertop that needs a splash of color? Well, we have got the perfect new lighting product for your interior design toolkit! This LED color changing panel allows you to really make your interior decor stand out. Use it for a single fixed color or simply press the remote control to produce one of four color changing effects. The CVCL-G57 is capable of emitting White, Red, Green, Blue, Yellow, Purple, plus ten additional bright colors. The CVCL-G57 multi-color (16 color) LED lighting tile can be mounted in many creative configurations and is guaranteed to bring interest to any interior environment. Use it to mix up the colors in a room, make it so that the rooms illumination matches the furnishing, or even use simple white when you just need some general lighting. Great for mounting on walls or into furnishings, this panel is the perfect way to make the counter in your nightclub stand out, draw attention to a feature product shelf at your store, and give your interior space a colorful shot in the arm. Whether you decide to install it as a single wall unit, as a series of wall tiles, placed into a countertop, or even installed onto the ceiling, this is one product sure to draw notice from everyone. Our new LED mulitcolor light panel is in stock right now and is available for bulk quantity orders, so get yours today and be ready to impress people in time for your next big hosted event. Can I use this in my bar? Yes you may but if you use this in a wet bar you MUST cover the panel with laminant or glass to prevent scratching of the panel surface and to prevent spilling of excessive liquids onto the LED panel. Any other precautions when mounting this unit into furniture or interior decorations? Yes - when mounted within furnishings, make sure you plan on how you will mount the IR box so that you will be able to use the remote to control the LED light panel. For example, if you mounted this into a product showcase, you might strap the IR box underneath the showcase, which means you would need to place the remote below the case to be able to aim at the IR box and change the lighting effect. Please do proper preparation work before installation. Can I use this as a floor tile? We do not recommend this type of application and it is not covered by the product warranty. Why are there no mounting screws included? We do not know how you may decide to use the LED lighting panel, so it is up to you to buy the screws, nails, or other hardware necessary to mount this product properly. Can I take off the four mounting brackets? Certainly. These are included to space the tile away from the wall. If you are not going to use this as a wall mount unit, then then brackets are probably not necessary.